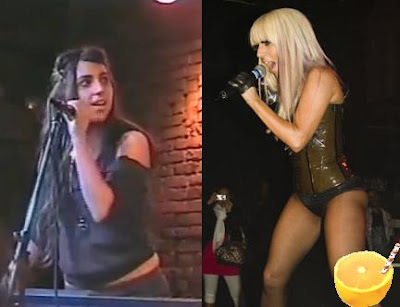 Gaga Before Gaga: A Thanksgiving Treat! I am thankful for friends, family, fun times, freedom, Orange Juice and Biscuits, and my pop stars! Especially when I stumble upon some great videos of them trying to make it before they made it! Because tomorrow is Thanksgiving in America, I thought I would give my OJBers a little treat! Yes my friends, that is Stefani "Lady Gaga" Germanotta in the picture above back in 2006 when she was "The Stefani Germanotta Band." Now don't get it twisted! I am not hating on Gaga in any way! I just love seeing people before they became stars. You can for sure see glimmers of the Gaga we all love and know today. The video shows Gaga playing a song called Hollywood at The Bitter End. So enjoy the videos, leave lots of comments, and please feel free to discuss slash play these videos at the Thanksgiving dinner table with all of your loved ones! Also, tell them about that really cool blog with the food name, Orange Juice and Biscuits! LOVE YOU GUYS! Have a WONDERFUL AND HAPPY TURKEY DAY! So glad that the Pilgrims and Indians decided to have a PARTY IN THE USA!!! Love it. One of your fav's links should be www.betweentheselines.com batch! Isn't she wonderful? I think Lady Gaga is a great performer!! She's soo creative and not afraid of a rise from her fans and audience. Yes! I Loves me some Gaga! En effet, c'est une chanteuse formidable qui a énormement de talent !